Awhile back, I was asked to review a new children's ballet DVD called Caterina and Her Baby Ballerinas. I can only assume the PR rep saw one of my articles on ballet as it relates to me (I take adult beginning classes) or to my son (I wish to enroll him in a preschool ballet class), because otherwise why would anyone in the ballet world target a random mother of a two-year-old boy? So, while other mothers of toddler boys (and many mothers of toddler girls) might have demurred, I was jumping in excitement. See, I was actually looking for children's ballet DVDs at the time. Perfect synergy, no? Every week when I head off to my ballet class, Mikko pleads and cries to come along with me. It's one of those break-your-heart-but-sorry-Mama's-out-of-here moments, because, you know, it's an hour and a half a week. I deserve an hour and a half a week to devote to exercise and stretching and centering myself and feeling like more than a mother, right? Right? I thought Mikko might appreciate more why and where I was going if I went ahead and signed him up for classes right away. He was still two at the time, and even though the school usually doesn't start seeing little ones until they're past their third birthday, I asked and received permission to bring him in for his trial class. We didn't make it out of the hallway. Mikko looked in on the class, already in progress because I'm late for absolutely everything (sorry, everyone in the world I've bothered with that trait! ), and quailed at the thought of entering that whirling mass of white-leotarded cuteness that is a roomful of three-year-old girls. So I sat out in the hall, and he stood on my leg so he could peer through the window at the dancing girls, like an adorable peeping Tom in training. For my part, I tried to look innocuous and casual, as if I always hung out in the hallway of the dance studio with a boy perched on my thigh. I had this brilliant idea after the fact that perhaps I could better prepare him at home for his next encounter with the scary experience that is Ballet Class. My plans tended along the same lines as my preparations for our airplane trip this summer. I went to the library and checked out every book I could find on children and ballet (and one on a dog ended up in the mix as well). I knew about Prima Princessa from a giveaway I had entered, so that DVD went onto my list, too. I then tried to squirrel away in my memory every detail I had seen or heard from the pre-ballet class I had witnessed from the hallway, so that we could practice some of the moves in our living room. I was sort of surprised (and yet, in retrospect, not) that the pre-ballet class, for the 3-5-year-old range (or thereabouts), is not very balletic. It's a lot of running in circles, kicking, and flexing toes, and it's a short class: thirty minutes long. It's a warmup for true ballet classes, when kids have the discipline, stamina, and, more importantly, the physical development to attempt proper ballet form. So Caterina, when the DVD came, was the perfect addition to my bag-o-ballet-prep. Here is a trailer, and following it are my thoughts on the DVD. The backstory is that Caterina is a Siamese cat who grew up among ballet dancers and so learned to dance (not unlike that dog story , seriously).  Caterina is played by a lovely dancer in a black costume and face mask, and she peppers her talk with phrases like "That's cat-astic" and "Feeling feline?" The theory behind using a cat is that little children respond well to animal narrators. The format of the DVD is a standard ballet dance class, at (is this sad?) my level. So, um, maybe 8-12 years old? The class follows the typical progression of barre exercises combined with stretching, followed by moves out on the floor. It finishes up with ideas of some simple but pretty moves to do with friends. The DVD is, therefore, a little old for Mikko, who just turned 3, although only a little old. I think kids who are familiar with ballet might start watching it at 3 or so, but beginners might do better starting around 5 years old (on up and up). That said, Mikko likes it anyway, probably because I mix our pre-ballet moves into our experience of watching it. We do a lot of running around, then freezing and pointing our toes, then more running, then kicking, then holding hands and twirling in circles. It's a workout! Is this following the DVD at all? Well, no, but it's our background accompaniment. 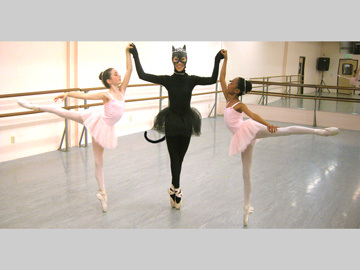 He likes the cat character, and I can hope he's absorbing some ballet terms (all that French!) and observing some proper ballet form. It's kind of like how I'm raising him bilingual in German as a non-native speaker — I definitely don't want to be his only influence in the language, and it's the same with ballet! For myself as an adult dancer, I do like having ballet class videos on hand. Sometimes I can't make it to class, and this is an easy and non-embarrassing way to practice what I would be doing in class. If you're a beginner, you could follow along and drop out whenever it gets too hard. As Caterina points out, you don't need special equipment like a barre — you can use a straight-back chair instead. I also think the woman playing Caterina does a good job of being feline and engaging. I even like the campy way she rolls her Rs when she tells us something we (puportedly) did was "purrrrfect." The only real turn-off for me on this video is the sound quality. It's got that class-film level of audio. The voices are louder when they're close to the camera, and tinny with a lot of background echoing and white noise when they're far away. It's too bad, because I imagine the only way to fix the sound would be to completely redo either the sound track or the whole film, but it would go a long way toward making the film seem professional rather than an amateur production. The video transition effects are a little cheesy, too, and the DVD case looks like it was put out by a mom-and-pop company. Not a bad thing, but first impressions count for a lot. The setting is a plain ballet studio, but I don't have a problem with that except to say that adding some scope with additional settings in any future installments might be nice. The costumes of the three dancers are simple but attractive. I hope what I saw was maybe just the first Caterina DVD as the company finds its footing, and that the company plans to improve the production quality with the next release. One other issue I have with pretty much any ballet DVD geared toward children (or book or whatever!) is that it focuses solely on girls. 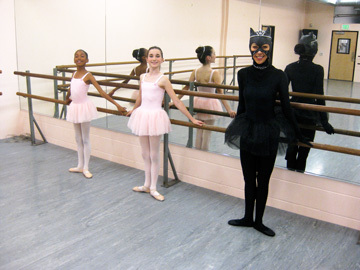 "Baby ballerinas" is what the viewers are called, and the sidekick dancers are girls. I understand this; I really do. But I have a boy. It would be nice if there were some love thrown to the boys who want to dance; they probably feel unusual enough as it is. Overall, I think Caterina is a lovely contribution to the genre of children's ballet DVDs. I just hope they fix their sound problems sooner rather than later. It's nice to have a narrator who takes children through the terms in a clear fashion and shows them how to have an enjoyable class session. I like how encouraging and complimentary Caterina is toward the baby ballerinas (ballerinos) onscreen and at home. Mikko keeps asking to watch it, so something's clearly bringing him back each time! 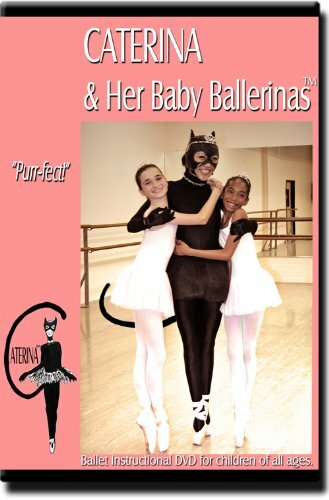 You can find the Caterina and Her Baby Ballerinas DVD on Amazon for $19.95 (and eligible for free Super Saver Shipping on orders over $25) or directly from the website at www.CaterinaBallerina.com for the same price of $19.95 plus $2.99 shipping/handling. Disclosure: I received a DVD to review. 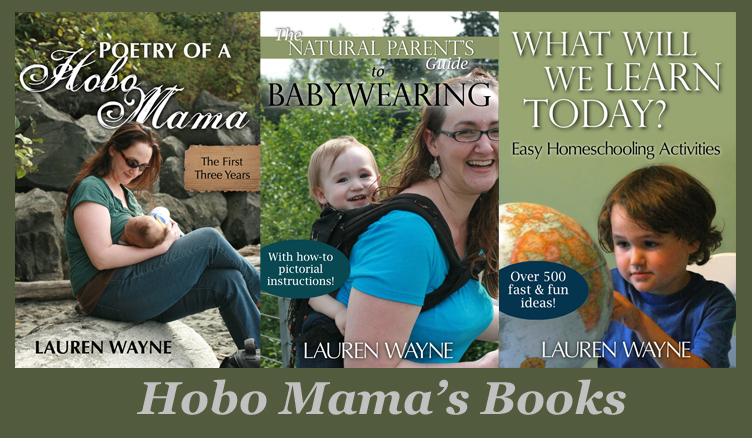 Amazon links are affiliate, because I need to pay for dance lessons.